Hamble Estate Agency use team Domestic Energy Assessors and can therefore guarantee that your Energy Performance Certificate is completed as a matter of priority. An Energy Assessment needs to be carried out on all properties within 28 days of the start of marketing. 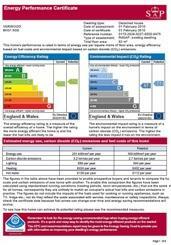 Energy Performance Certificates are required for both sale and rental properties and are valid for 10 years. Should you have any questions regarding the energy efficiency of your property prior to going on the market, or to arrange an EPC for either sale or rental purposes please feel free to contact us. Here you can log in or sign up to the members area of our website. Once you have an account, you can log in to manage your personal details, email alerts and saved properties. Once you have created an alert, properties are sent to your email address at your chosen frequency when a new property is published or a price change made. To manage your account at any time, click on the members icon at the top of the screen, log in using your credentials, then click again to choose what you would like to do.